CHART: Remember When Poor People Saw Their Incomes Grow Faster Than Rich People? Here’s an interesting chart from the WonkBlog that we saw on the Real-World Economics Review Blog. 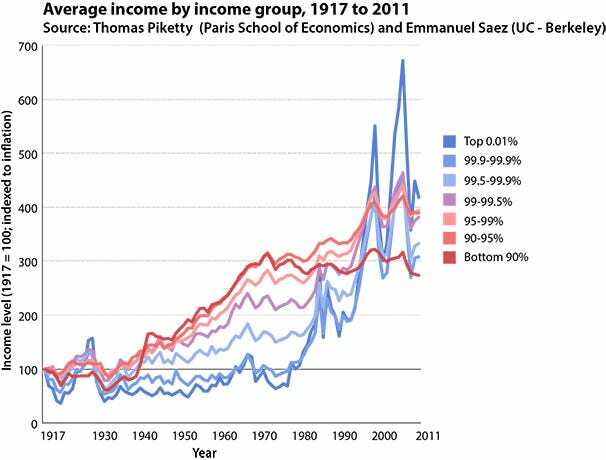 It shows that Americans in the bottom 90 per cent of income brackets (represented by the red line) saw their paychecks rise faster than the highest paid Americans for most of the last century. In other words, the income gap was disappearing. 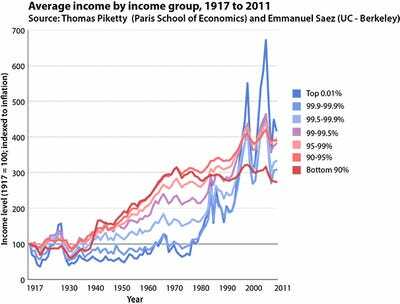 But then that changed in the 1970’s when the incomes of the wealthiest surged. In 2007, the top 0.01 per cent had an average income almost seven times that of 1917; the average income of the bottom 90 per cent had barely tripled. The country has grown more unequal, not less, since then. And, interestingly, the 90-99th percentiles all saw their average income grow faster than all but the tippy-top of the top 1 per cent. The divide between the rich and the rest isn’t the only gap growing, in other words. The gap between the ultra-rich and the merely rich is growing, too.